Camp rock birthday cake - Excite your kid's with this 3D guitar cake by Land of Cakes New York. Delight your kids with an elaborately styled musical instrument cake. 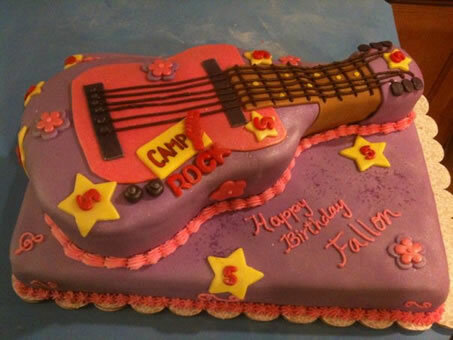 This camprock guitar cake is the perfect idea for your kids next birthday party. The guitar and the base of this cake is made entirely of cake. It is also filled with one of our many delicous cake fillings. We can also adjust the size of the guitar cake to accommodate the size of any party. Order your next cake from Land of Cakes New York.